Things have been going terrible for the Yankees in the last month, everything seems like going opposite of what is supposed to be happening for them. The back end of the bullpen, which was the considered the greatest strength of this team, is currently the main reason why the team is among the worst in baseball since the middle of June. The Yankees have not won a series since June 11th and failed to do so again on Wednesday afternoon against the already declared Blue Jays in the Bronx. After the starting pitcher Michael Pineda had one bad inning and fell behind, the team looked uninterested for a couple of innings. The offense led by MVP and Rookie of the Year frontrunner, Aaron Judge, came back in to the game slowly. The Yankees even took the lead in the game, and things looked like getting better for the Yankees. However, the bullpen failed again and gave the lead back to the Blue Jays. The offense went down quietly for the rest of the game, and the Yankees could be five games of the division lead by the end of Wednesday. Did me declaring the Yankees dead, finally wake them up? I firmly believed that the Yankees were not dead and were going to right the ship, but moments after me declaring them possibly not dead, the #AviMehtaCurse struck and they gave up the lead and lost the game. I have in fact have declared them dead and once someone is declared dead there is no going back. As I have said before, once a team is declared dead they are no longer going to win the division. The Yankees have no chances to win the division in my opinion and the best they could do is making the playoffs via a Wild Card. 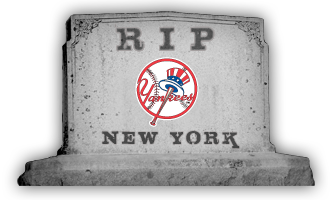 The teams that have been declared dead thus far are Orioles, Blue Jays, and Yankees. The Orioles are the only team that been declared twice, follow along on social media to see if the Yankees are declared double dead. I am not saying the Yankees’ season is over, and they can come back to win the division, but I highly doubt it. The Yankees are dead, might as well declare the Knicks and Jets dead for next season and count down to next Opening Day for some excitement in my sports fandom. But what about that old saying, “You can never count the Yankees out”? Or is it really as dismal as you say? Whew! I thought you were serious!